Customize your driving experience with the Driver Mode Selector. Choose between Sport, Tour, Snow/Ice (excludes V6 1LE) and Track (V6 1LE, SS and ZL1) to instantly adjust up to eight different vehicle characteristics. Available Magnetic Ride Control™ technology reads the road every millisecond and changes damping in just 10 to 15 milliseconds. As you plunge into a corner, a charge hits the patented suspension fluid, stiffening the suspension and reducing body roll instantaneously. 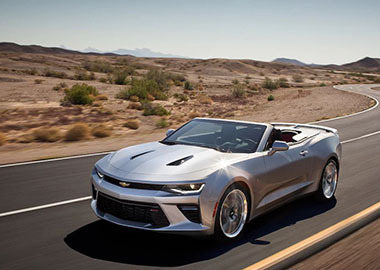 The Camaro Convertible offers the same roof line as the Camaro Coupe with a fully automatic soft-top that seamlessly disappears beneath the hard tonneau cover with the push of a single button – even at speeds up to 30 mph — or remotely using the key fob. And with modular underbody bracing, you’ll experience the same sharp, nimble handling as the Coupe. While you can upgrade your interior with RECARO® seats or available heated and ventilated seats, every Camaro starts with a refined cockpit optimized for performance driving. Interior spectrum lighting, standard on 2SS and ZL1 and available on 2LT, courses around the radio, door trim and cup holders, transitioning between 24 selectable colors. The color spectrum reacts to changes in drive modes, the lighting gives off an ambient nighttime glow, and there’s even a pulsing light show mode you can select when parked. Download and experience the 2018 Camaro right on your smartphone and tablet. Customize it by mixing and matching wheels, colors, stripes and accessories, then take a 360° spin around the interior. 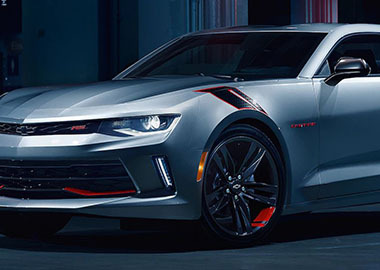 While the all-new Camaro is loaded with performance technology, it also offers a surprising amount of modern driver-centric tech like a Head-Up Display, a wireless smartphone charger and Apple CarPlay™, each available and ready to upgrade the driving experience.